Cheng is working on the endpapers for Demon City. Post-Vornheim design means you use the endpapers, especially for things the GM might wanna reference all the time. 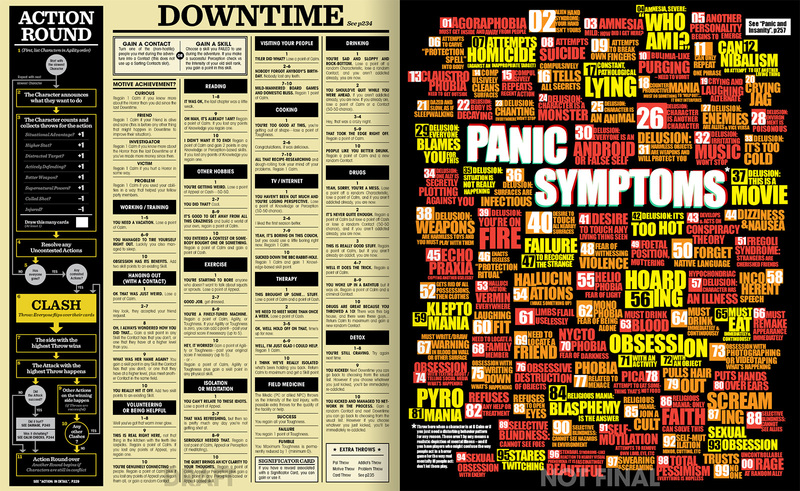 So from the left we've got the action system (maybe looks more complex than it really is but new GMs will probably appreciate it), the Downtime System (after any undeniably successful session) and d100 panic symptoms on the right (and nice one Cheng fitting all 100 in there). And yes, the idea is every page will be full-on like this. If you're into it, help out here. Zap, it looks like TV/internet only goes to 9, not to 10. Is that intenriomal? I keep throwing money at my screen but nothing is happening. How many times do I need to back this kickstarter? 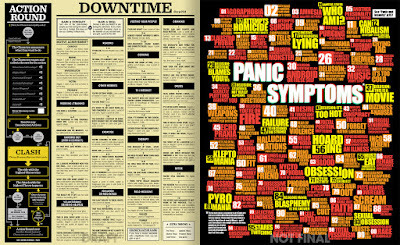 I love that the downtime is like the classified ads of a newspaper.